Contact us for special pricing and offers on this item! The Pro-Stitcher® quilting system integrates Janome’s world-class quilting machines with the latest computer technology. The software is managed from the included touchscreen tablet conveniently mounted on top of the quilting machine. This rich and full featured software is easy to learn and makes precise quilting simple and fun! The Janome QM Pro-Stitcher® quilting system integrates Janome's world-class quilting machines with the latest computer technology to help you finish more quilts. Pro-Stitcher guides the machine to quilt any design you want to use, create, or customize. It works with the Janome Quilt Maker Pro 18. Expand your quilting possibilities with this easy-to-learn, easy-to-use, computerized system and have fun finishing more quilts! 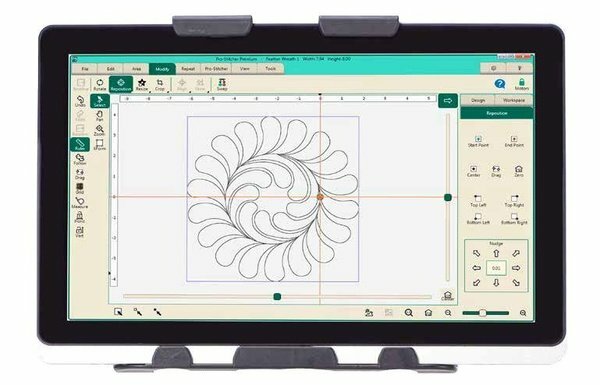 Using integrated HQ technology, the Pro-Stitcher offers the best of both worlds: computerized quilting and free-motion quilting in the same package.